Bleach is a chemical that will alter the chemical bonds of an item in a way so that it absorbs less visible light or none at all. Bleaches come in many different packages. Sodium hypochlorite, lemon juice and sulfur dioxide are all examples of bleaches. Bleach is used in many ways: to clean clothing; to disinfect and kill germs and bacteria; and to lighten the color of hair, teeth, skin and food. An example of an everyday item made possible by bleach is white paper. Those with an allergy to bleach should avoid certain chemicals. Chlorine is a popular additive in many household cleaners. Chlorine is a lung and eye irritant, and can cause toxic fumes when mixed with ammonia or acid-based cleaners. Phosphates are minerals that act as water softeners and are frequently contained in automatic dishwasher detergents. 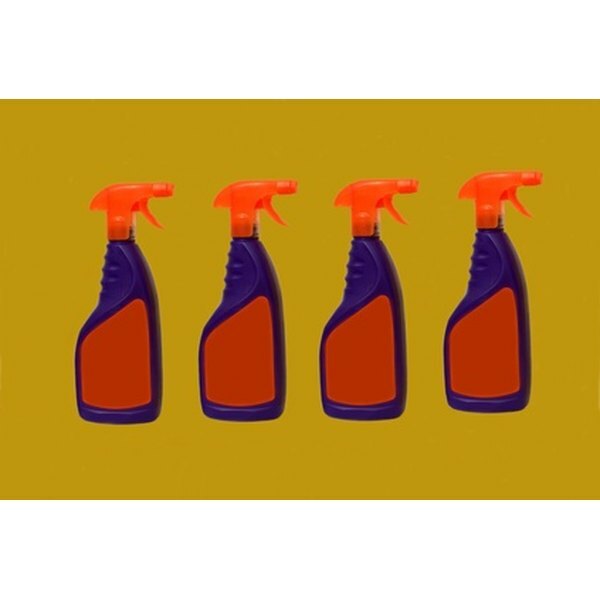 Alkylphenols are found in some laundry detergents, disinfecting cleaners, all-purpose cleaners, spot removers, hair colors and hair-care products, and spermicides. These chemicals may trigger a bleach allergy. A less volatile alternative to harsh bleaches is available and can be made at home. The ingredients are 12 cups of water, 1/4 cup of lemon juice and 1 cup of hydrogen peroxide. Mix the ingredients together. As a laundry detergent, 2 cups should be added to every wash load. Use it in a spray bottle as a household cleaner. Not only is this recipe less-toxic, it's also cheap and environmentally friendly.